People have been eating Mexican food for years, maybe their whole lives, but what kind of Mexican food are you eating? Where the food came from, not the restaurant but region, can make a difference in the flavor and the ingredients used in the food. Chances are, what people in the United States call authentic Mexican food, would still be classified as Tex-Mex by anyone south of the border. What makes the difference between these terms? As people began to move to and explore the west, they began experiencing new foods that were native to that region, but still not foods that are native to Mexico. Ingredients like beef and wheat flour that aren’t necessarily common or popular in Mexico began making their way into Americans’ homes because the ingredients were so close and readily available. Mexican restaurants in Texas and New Mexico started to incorporate more familiar ingredients because so many people were learning to love the food. And so Tex-Mex was born, even though that term wasn’t widely used until the 1970s. Many will be surprised to learn that burritos are really Tex-Mex. Also surprising, beef, wheat flour, black beans, canned tomatoes, and cumin are not commonly used south of the border. Beef was actually the choice ingredient for Texas ranchers and is only rarely used in regions in the far northern part of Mexico. What about cumin? This spice actually has it’s start in India, eventually heading to England, and finally, the US began using it in dishes. As for tortillas, in the south, they are primarily made of maize. Tex-Mex started in Texas with northern Mexico influences and has yellow cheese and bready characteristics. Mexican food is a cuisine that originates from Mexico and uses maize-based tortillas, more pork instead of beef, and uses white cheese. What is New Mexican Food? To make it more confusing, Tex-Mex in New Mexico also has different characteristics. 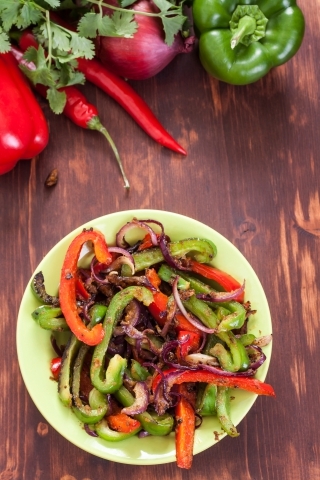 New Mexican food tends to be comprised of both northern Mexican and Pueblo Indian foods. 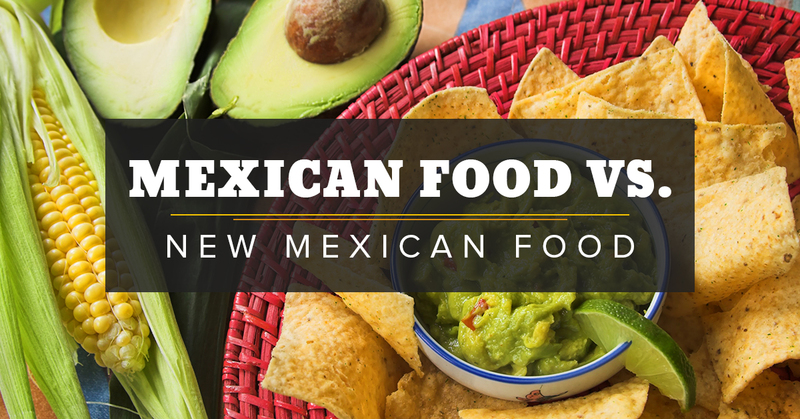 Signs of New Mexican food are roasted green chiles, beans, rice, tortillas, and cheese. The green chile sauce that is a staple in New Mexican food is poured over enchiladas, burritos, and sopaipillas. There are also many different techniques used to cook with green chiles, including stuffed in breakfast burritos, fried into rellenos, stuffed chiles, or inside a stew with beef and potatoes. Red chiles, on the other hand, are rehydrated and used in tamales, enchiladas, and huevos rancheros to give the dishes that signature spice. A favorite Mexican dish no matter you’re from is enchiladas and the difference in preparation deserves special attention. Tex-Mex typically wraps a choice of protein in a tortilla with cheese, red or green chile is poured on top, more cheese is added on top and the dish is then baked. 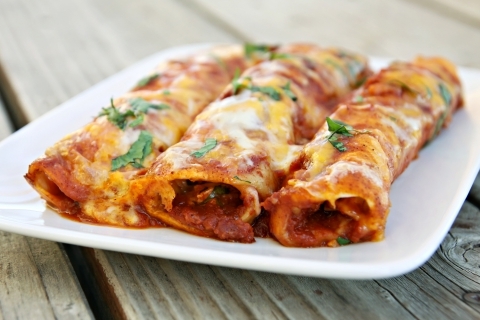 Mexican enchiladas are prepared by frying the tortilla after it’s been dipped in a chile sauce, the filling is then added and the dish is served with a little cheese and sauce on top. Mexican cuisine is wonderful and delicious whether you live south of the border, Texas, or Santa Fe. If you want to try authentic New Mexican food, come to Tortilla Flats where we have tasty tacos, saucy enchiladas, a tequila bar, and plenty of cheese.